Don Quixote is famous for confusing windmills with giants in one of the most well known novels in Spanish literature set in the province of Castilla La Mancha. However, he could have just as much fun with the windmills that are dotted along the Costa Blanca and Costa Cálida in southern Spain. Many town councils have spent time and money restoring the windmills of the region, most of which date to around the nineteenth century. Torre Pacheco in particular has restored four of the fourteen windmills within its jurisdiction and plans to restore the rest over time. In fact, the Tourist Information Office in the town centre has produced a brochure for a ‘Windmill Tour’ that can be followed around the town and its surroundings. Every April, a special ‘Windmill Fiesta’ takes place where the mills are set working and events are organized explaining how the windmills were an important part of the agricultural process in the area. The earliest reference to windmills dates back as far as the early 1300’s, when their main use was for the grinding of flour. The first documentary evidence that shows the existence of windmills in the Torre Pacheco area dates from the late 18th century. These documents make reference to a Mr. Felix who was given a lease of a flour windmill. By the late 19th century, windmills were also being built for raising water to irrigate the land for the growing of crops, although this was mainly in the Cartagena area of Murcia province. Several of these windmills, sadly now in ruins, can be seen as you travel along the AP7 motorway towards Cartagena, south from Alicante. Another town with well-preserved windmills is San Pedro del Pinatar which has two, one either end of the walkway that heads out into the Mar Menor near the mud baths. The town is a very popular holiday resort and during the summer, the walkway between the windmills is filled with happy families ‘promenading’ in traditional Spanish fashion of an evening. The city of Torrevieja also has a restored windmill, situated just on the outskirts of the main town centre which was unfortunately recently vandalized. 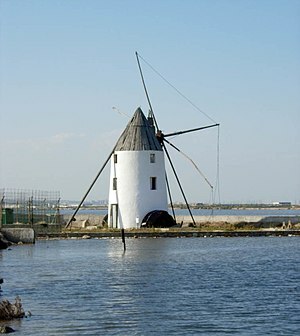 However, the town hall and the family who have been responsible for the upkeep of the windmill for many years worked hard together to restore it once again, although the sails themselves have not been replaced. These windmills are an integral part of the history of agriculture in the region, as well as being beautiful to look at, so saddle up Rosinante, sharpen your lance and head out to have a look! This entry was posted in Spanish art and architecture and tagged Costa Blanca, Don Quixote, Murcia, Spain, Torre Pacheco, windmills. Bookmark the permalink.